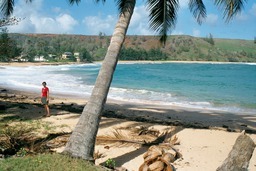 Kauai is the oldest and northernmost of the Hawaiian islands and its natural beauty is simply stunning. It is also known as "the garden isle" and I found this nickname to be true as the island is very green and vegetation is abundant. One thing that I liked about Kauai is that it is still largely unspoiled, mostly rural, with no hotel strips and no four lane roads (well, there are a few big resorts but this is not the norm here). What is amazing about this little island is how many things one can see and do in such a small place. One shouldn't miss the Waimea Canyon, the Napali Coast (the Kalalau Valley), the many waterfalls, the view of the taro fields from Hanalei and the spectacular beaches (which are all public).